For a while now, I’ve been intrigued by this battle from the English Civil War. Within the last 3 years I have failed twice to visit the battlefield – just a little far from home for the time available on each occasion – so I have decided that the next best thing would be to have a go on the tabletop. Not as a walkthrough - I have no appetite for that at all, but as a game which involves something like the correct forces and – more challenging – has a chance of reproducing the strange events of the real battle. Strange? Well, the action is pretty much ignored in the standard histories, though, since it involved something close to 8000 men, it was by far the largest ECW battle to take place in Wales, and its result – a surprising and catastrophic defeat for the Royalist side - effectively ended Royalist influence in Wales, and had far-reaching consequences for the war elsewhere. (1) Royalists besieged Montgomery Castle – they had about 1500 horse, 3000 foot. Since they had no serious artillery, the siege was more a blockade than an attempt to break in. (2) Parliamentarians arrived with about 1500 horse, 1500 foot, and, having seriously underestimated the Royalist numbers, set about pushing through a mounted force, to re-provision the garrison. (3) Royalists attacked – downhill, across pretty open ground, and pushed their outnumbered opponents back towards the River Camlad, which could only be crossed at a single bridge on the Welshpool road. (4) As they prepared to drive the enemy into the River, the Royalist forces suddenly suffered a major collapse of morale, and were routed from the field, losing all but about 100 of their foot troops in the pursuit. Hmmm. The action is well documented, there are eye-witness reports and commentaries from individuals on both sides. The Royalist army was experienced and well officered, though their recent experience had been unhappy. Parliamentarian accounts claim the influence of the hand of God (which might explain a few things), but give great credit to the leadership efforts of a few of the senior officers, and, in particular, to the courage and vigour of Wm Fairfax’s Horse and Sir Wm Brereton’s Cheshire Regiment of Foot, who rallied with such ferocity that they turned the day. The Royalist writers take the opportunity to blame each other, and name specific units which broke and ran in a shameful manner. The message is consistent, if the details vary a little: one moment the Royalists were on the brink of victory, then within a very short time they panicked and ran. The Battle of Montgomery is said to have lasted little more than an hour. Interesting. I am currently on holiday (far away...) – I have some of my reading material with me, so homework can continue to an extent. I am focusing at present on the battlefield, and how best to represent it on the tabletop, on the OOBs (of which more in a moment) and how to allow for the kind of events which destroyed the Royalist attack. Let’s look at this last bit first. If I set up the armies as they appear on paper, and the Royalists proceed to push the (outnumbered) Parliament lot back into the River Camlad, few people would give the Parlies much chance. One way to give history a slight chance of repeating itself would be to allow some kind of fancy Chance Card event or a nuclear dice throw to stand the battle on its head. I don’t like this – the game is then obviously rigged, and it’s rigged in a manner which makes it pretty clear that there is something fundamentally wrong with my rules. I’d prefer it if there was some way of allowing for an inherent fragility in the Royalist army, veteran or not, and play the game as normal. My rules, as ever, will be Commands & Colors based, though on this occasion the shape of the battlefield suggests to me that the forces will fight from the ends of the table rather than the long sides (which means I shall substitute a dice-based activation system for the Command Cards), and, since I am keen to have the town and castle at one end, I’ll use my bigger table size - 17 hexes by 9. At 200 paces across a hex, that’s pretty close to my estimate of 1.5 miles x 1 mile for the main field. My rules do allow for troops to be classified as Veteran or Raw, and maybe this gives me a way to address the problem. The regiments which are known to have disgraced themselves were all veterans, in the sense that they had been fighting for years, but the “Irish” [sic] units which came from the Shrewsbury garrison had mostly been badly mauled at both Nantwich and Marston Moor, and Tom Tyldesley’s horse had been through both of these and Ormskirk, where they had suffered considerably. Given the hardships they must have been under and the big proportion of replacement recruits that must have been needed to make up the numbers, my inclination is to take a bit of a radical step, and mark a number of supposedly experienced units as Raw, which could well introduce the element of fragility I am looking for. I’ll think further about this, but at least I can see a way ahead for the moment. It seems that neither side had any significant artillery present – I shall ignore artillery, though the castle might have a gun or two, and the garrison of the castle certainly had plenty of ammunition. I’ll describe the battlefield in more detail when I have better graphics facilities available! That’s about as far as I’ve got, and that’s probably more than enough to be going on with. I am aware that the bold Jonathan Freitag, wargamer, cyclist and blogger extraordinaire, wrote up a couple of reports on a Montgomery game recently, so I’ll certainly check those out. I have found that searches for the Battle of Montgomery on Google produce an overwhelming amount of information about El Alamein! I reckon there is a fairly good Phd to be had looking at the 'Irish' army and why it failed to have the impact expected on the war. It certainly won't be me writing it though. A book on Montgomery coming this year from Helion that I am looking forward to. I wonder whether the Royalists may have run out of ammunition? There was a convoy of munitions seized a few weeks before. Thinking of the ACW veteran often means self preserving rather than dashing. I have walked the field and castle quite a few times and I would recommend it, have a look at Stokesay Castle while your in the area. Hi John - I do intend to go back and try again - if I give you plenty of warning, perhaps you could show me round the place. Forthcoming Helion book is on my radar - written by the guy who did a very nice work on ECW in Shropshire. Running out of ammo is a very interesting shout indeed - only reason to reject that as a possibility is that it seems unlikely that none of the Royalist accounts mention it, and it would have been a valuable excuse, I think. Interesting. I'll get back to this in a couple weeks or so. Ah, you flatter me, sir! I look forward to your replay of Montgomery. We found it to be an enjoyable situation. In my replays, current tally stands at one victory apiece. Turned out to be an even contest under Baroque. Very informative post, will be following with interest. 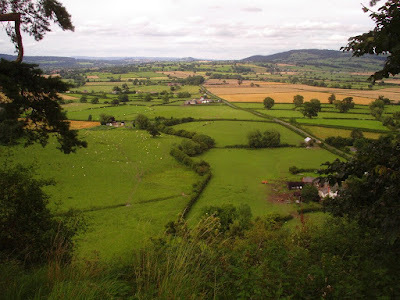 That photograph is taken from the castle itself, looking north towards Welshpool, the road is the B4388 with Offa's Dyke running roughly parallel to the right, you can't really tell from the photo but you can from the real location. The town of Montgomery is to the east, or to be precise slightly behind and little to the right if you were standing taking the photo. Thanks for this, very much. I was sent the photo, with a note that the river was in the trees in the foreground. A dangerous place, the Internet! I repaired the caption. I'm struggling a bit, using my tablet for blog work on holiday - it's like standing on a tightrope while cooking lunch. One big lack at present is I don't yet have an app to re-size pictures, so am reliant on other people's efforts! One could always come up with an alternate name for such troops when being used as Raw, such as Battle Fatigued, Worn, fragile or hopefully something better. Won't change how the rules work but will sound better in write ups. These words are always tricky - whatever this work becomes, it will still mean "unit has a yellow counter". Maybe "Raw or Disillusioned" would be a better classification in the rules. What John said about ACW veterans hits the nail on the head for me. This is one of my favourite quotes on the subject. ‘”What a pity!” some officers say. “The only troops we have are recruits!” As for me, I love the recruits. They do not know what danger is, and they stand up manfully in their first battle.’ (De Ligne quoted in Duffy, The Military Experience in the Age of Reason. I'm sure this is true. I recall in the "Band of Brothers" TV movies, the longer guys survived in the war the more they felt it would be a shame to be killed after getting so far. The Marie-Louises of 1814, sadly, seemed to have gone to their deaths with more enthusiasm than was expected. Without bothering to go back and do the research, I recall that during and after WW2 leaders reached the view, since validated by modern research, the soldiers have a definite bell-curve type effectiveness. Newbies facing combat for the first time are either reckless or liable to shock. With a little experience they become effective fighters, clever enough not to get shot but willing to take the fight to the enemy. Then after a period in combat they become risk averse. Plain fatigue, the accumulation of psychological stress, and a feeling that it's someone else's turn all play a part. Excellently expressed, sir - the re-wording of my "Raw" category should be an appropriate euphemism for "Outside the Bell-Curve". I got an interesting email from Vance, who suggested that the veteran soldiers in the Royalist attack were getting carried away with success when they suddenly remembered they had the useless fellow Lord John Byron in charge, and they had never yet won under him - in addition, Byron is believed to have been a long way from the sharp end, standing with the reserve, carefully guarding the siege trenches.